From Germany. Multi-pose figures, molded in hard, styrene plastic. 72400 Modern Passers-by 6 figures. 72403 Modern Girls 7 figures. 72406 Modern Mechanics 6 figures. 72409 Modern German Luftwaffe Pilots & ground crew 6 figures. 72410 WWII German Luftwaffe Ground crew 6 figures. 72411 Modern Civil employees, standing 6 figures. 72412 Modern Civil employees, walking 6 figures. 72413 WWII Civilians waving at the roadside 5 figures. 72414 Set of small animals. 72511 Horses, cows, sheep 22 animals. 72512 Modern Passers-by, standing and walking 25 figures. 72513 Modern Uniformed people, dressed summerly 24 figures. 72517 WWII German 8 cm Mörser 34 in combat 5 figures with mortar & accessories. 72528 Modern Civil travellers and personnel 18 figures. 72529 WWII Allied Military police. Vienna 1945 5 figures. 72530 Modern US Tank crew 8 figures. 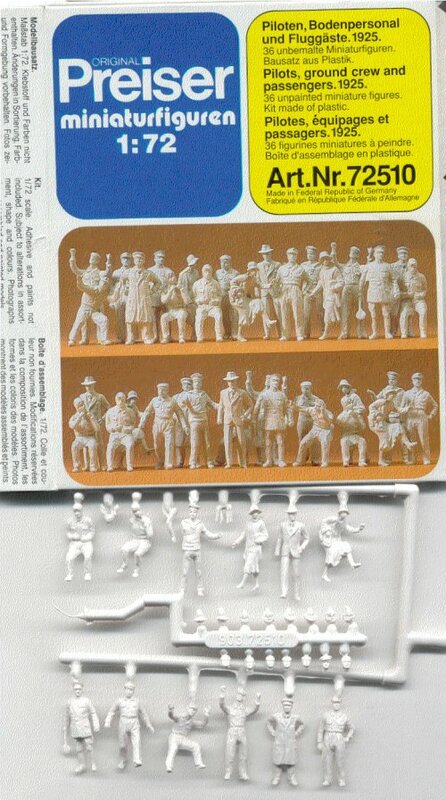 72531 WWII Refugees 7 figures & Accessories. 72532 WWII German Military police 6 figures & Accessories. 72533 WWII German Infantry riflemen lined up 36 figures. 72536 WWII German mortar crew, lined up 7 figures.